"Over 1,000 users on our platform have signed up as dates for hire for the New Year break," Cao Tiantian, founder of date-for-hire app Hire Me Plz, told Reuters. "I'm still seeking people to fill my time slots," said the woman from the southwestern province of Sichuan, who has just two half-day slots left to fill over the next seven days. "But only those who stay in the same province as me. I don't have time to waste on travel," she added. 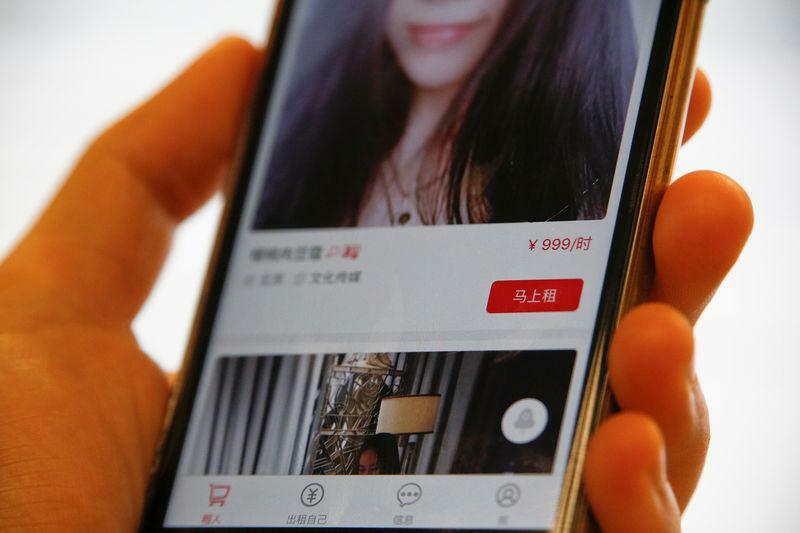 "Our business model is still new, though an increasing number of young people have accepted the idea of selling their time as commodity," said Beijing-based Cao, who expects date-rental to become a multi-billion dollar market in five years. Since its launch in 2015, Hire Me Plz has garnered a user base of 700,000 and 1.7 million followers on Tencent's <0700.HK> WeChat, China's biggest mobile social media network. Dating services are also offered by individuals on Baidu's (BIDU.O) Tieba classifieds and Tencent's QQ messaging service. But buyers beware - those services provide no identity authentication, unlike the mobile apps. Hire Me Plz's Cao said the initial aim of her app was to help overcome the problem of loneliness experienced by young people leaving home to work alone in big cities. "I was seeking a more effective way to ask someone out. Who wants to chat for months via social networks and end up with nothing?" Pally Asia, which calls itself a "rent-a-friend" platform, plans to push out an app in the first half of this year.